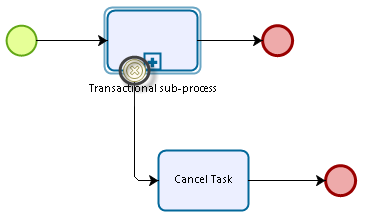 When you have a transactional Sub-Process it is possible for it to have a Cancel End Event. Bizagi allows you to raise cancel end events from Business Rules. To raise the cancel end event just use following function, this will interrupt the transactional Sub-Process and deviate the normal path towards the cancel path. This function will add the RaiseCancelEndEvent log file in the project folder. •message: A tag to identify the cancellation in the log file. Consider the following process, for an online retailer. If the credit card is not valid a Cancel End Event will be raised. To do so, we are going to set the function into an "On Exit" activity action. Then, if the credit card is not valid, the path of the process will follow the cancellation path. When the cancellation is raised, a log file will be created within the project folder, showing the cancellation details.